There is nothing more adorable than baby feet! They are just so cute, chubby, and squishable. Of course, even though I am sure you could look at them all day long, in colder weather you need to be sure to cover them up. This is usually a lot harder than it sounds! Unless you make sure that you have the best baby socks that stay on, you’ll be peaking at those piggies even when you don’t want to see them! Now, with so many different socks out there, it can be pretty tricky to find a pair or a brand that actually stays on your little one’s feet, especially since they are so squiggly and wiggly. Well, don’t worry! I have got you covered! In this article, I’ll guide you through everything you need to know to find the perfect pair of socks. I have also taken the time to provide some necessary in-depth analysis of some of the best baby socks out there. Let’s get to it! 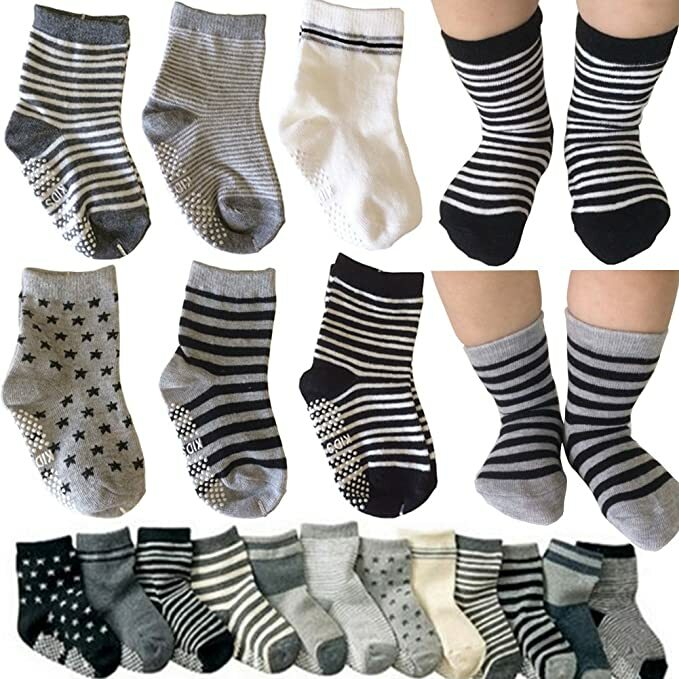 There are several different kinds of socks out on the market, but not all of them will stay on as well as you would like. The very best baby socks that stay on all happen to be ones that reach right up to your little one’s ankle, but no further. If you get a sock that goes below the ankle, their squirmy feet will jostle the socks right off. At the other end of the sock, length spectrum are longer socks that almost reach your baby’s knees. While these might seem like a good idea since they reach so far up, they are actually more likely to stretch out and fall off. That is why you should look for ankle length socks. They won’t get stretched out since elastic fastens them in a skinny spot between two bigger areas. This makes them by far the best baby socks that stay on. There are several different factors that you need to keep in mind when you are looking for the best baby socks that stay on. In this section, I’ll cover everything you need to know to find the perfect pair for your little pumpkin’s piggies. 1. Comfort – Nothing will make your baby want to get their socks off of their feet quicker than by making them wear uncomfortable socks. Believe me, if your kid doesn’t like the way that the socks feel or how they fit, they will let you know right away by trying to pull them off! To avoid this rather regrettable situation, you should make sure that the socks are made out of soft, stretchy, and breathable materials. That way, your kid is more likely to keep them on. Also, if there are tags inside of the socks, make sure that you remove them before you put them on your baby. 2. Fabric – The best fabrics for socks are usually some kind of a cotton blend. Cotton is one of the most breathable fabrics around, making it exceedingly comfortable. This will help to keep your little one nice and cool. The reason that I say you should look for a blend, however, instead of just straight cotton has to do with the fabrics ability to stretch and withstand daily use. Cotton is a pretty durable fabric, but it does tend to stretch out over time. By adding in another fabric, such as polyester, you gain a bit of stretchiness to go along with a bit more durability. This makes socks that have this blend the ideal type for babies to wear. 3. Color Options – There is nothing quite like dressing up a baby in adorable clothing. Which is why it is a good idea to make sure that you look for a sock brand that offers a variety of colors. That way, you’ll be able to coordinate them with whatever color of clothes you have in mind, which will just be sooooo cute! 4. Gender – Now, to me, socks are socks. I have never bought into the idea of getting them based on the gender of the kid. I personally like to go for unisex socks, since they can work for either gender. Plus, if and when you decide to have another kid, and they happen to be a different gender than your first one, you’ll still be covered in the sock department. Of course, if you are looking to make your baby boy look manly or to keep your little princess girly, there are lots of options out there. The most important thing is to keep in mind that you want that you want socks that stay on, first and foremost. 5. Durability – This won’t be too much of an issue when your little one isn’t on the move yet, but you should be sure to get a pair of socks that will last a good long time. Otherwise, you will have to replace them with much more regularity than you would like. 6. Easy to Put On – I know, I know, you want these socks to stay on your baby’s feet! But that doesn’t mean you should need the Jaws of Life to get them on. If, however, you find socks that have an elastic band near the top. This band will stretch open nice and wide when you are going to put the socks on, but also retract enough to keep them secure around your baby’s ankle. The fabric of the socks should be stretchable as well since that will also make it easier to get the socks on. 7. 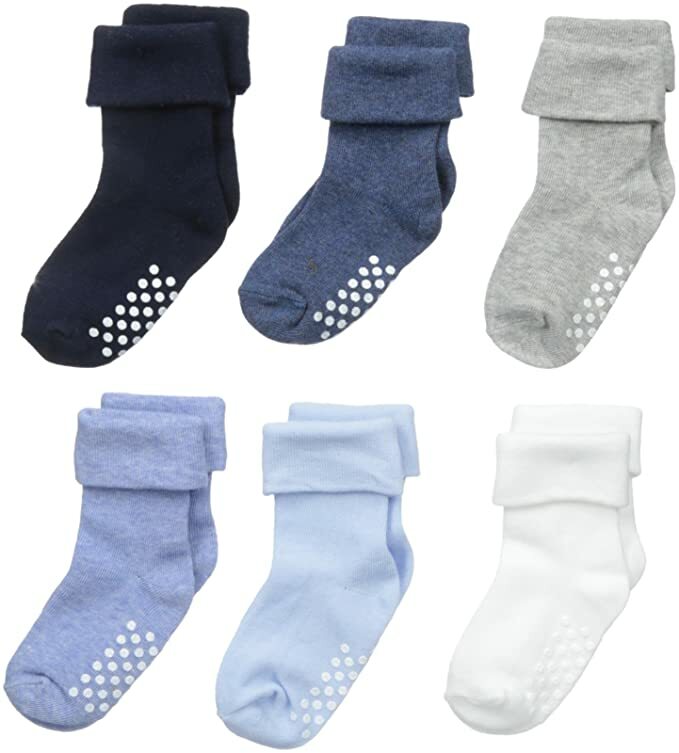 Anti-slip – Most baby socks come with some sort of grips on the sole, so that when your little one starts to walk they won’t have any trouble getting around. I’m sure you remember what this looks like from your stay in the hospital when you had your little one! While these grips aren’t super important when your kid is immobile, they are essential for when they begin to walk. Not only will these grips keep your little one from slipping and sliding when they go for a stroll, though. They will also make it that much more likely that the socks will stay on. Whenever your kid rubs their feet together, the grips will end up pulling the socks back up their leg, making it nearly impossible for them to get the socks off accidentally. The Good: If you are truly in the market for the best baby socks that stay on all the time, then you should definitely check these out. They are made out of high-quality cotton, which makes them extremely breathable and comfortable. They are also some of the easiest socks to keep clean. But that’s not the best part about these socks. That has to be the turned over cuff and non-slip grips on the bottom. The cuff is super strong, which will help to keep the socks on those wiggly little toes. The grips will help to keep your little walker upright and happy. The Bad: While the cotton that these socks are made with is of the highest quality, it may wear out faster than a hybrid fabric. If you are hoping to utilize these socks for more than one child, they might not stay on as well as you would hope. The Long and Short of It: These just might be the best baby socks that stay on on the market today. They are made with high-quality materials that will help to keep your kid nice and comfy. The Good: Not only are these socks nice and comfortable, but they are also thick. 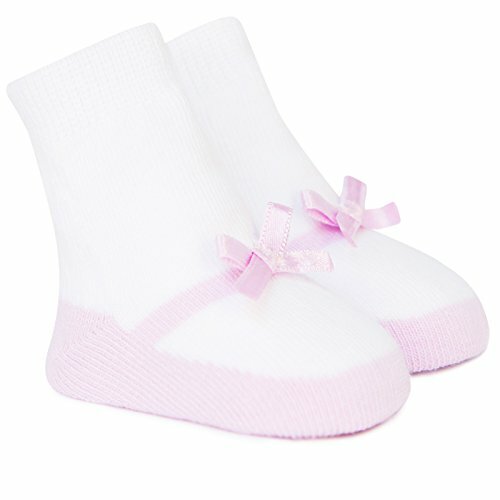 They are a knitted sock, which gives them extra cushioning to help keep your baby comfy. They also have a non-slip grip on the bottom to help your little one walk on slippery surfaces. Since these socks are made out of a knit fabric, they are a bit tighter. This is all for the good, however, as it will make it less likely that they will come off, even if your kid is a kicker. The Bad: These socks are designed to go a bit higher on a child’s leg than some others out there. Like I said earlier, while this seems like a good idea, it actually tends to make them stretch out more and slip off more easily than an ankle length sock. The Long and Short of It: If you want a thick and comfortable sock that will stay on your little one, then these socks would be a good starting point. The Good: If you are in the market for a set of absolutely adorable socks for your little lady, then these are a great choice! They are designed to look like ballet slippers, which is just too cute! They also are a hybrid fabric, which helps them to be both tight enough to stay on, yet stretchy enough to accommodate any growth spurt your kid might (will) go through. The Bad: These socks are pretty much exclusively for girls, making them a tough sell for anyone that is trying to get socks for a little boy. The Long and Short of It: These socks are designed for a baby girl, and will stay on her feet very well due to their tight design and hybrid fabric. The Good: Of course, if a company does something well for one gender, they will usually do just as good of a job for the other! 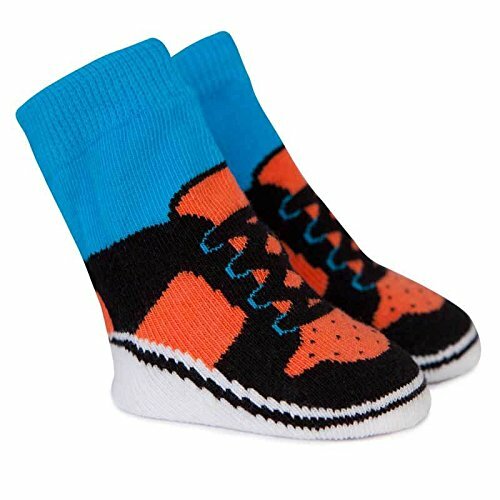 These socks are designed for the little man in your life and are made to look like a pair of sneakers. They are made of the same stretchable hybrid fabric as the girls are, and should stay on your little man’s feet very well. The Bad: If you are in the market for a great pair of socks for a baby boy, then these will work very well. The design, however, does have its issues. With the addition of laces on the socks, you might have a tough time finding shoes that your kid’s feet will fit in. The Long and Short of It: These socks are designed for a little boy. Though the added detail of the laces might make them tough to fit into shoes, they should have no problem staying on your boy’s feet. The Good: These are some of the softest baby socks that I have ever felt! Though they are extremely soft, they have a rolled over cuff that is just tight enough to keep them on your baby’s feet. They come in plenty of colors to make it easy to coordinate with your kid’s clothes, and the anti-skid sole will help to keep your little one upright when they learn to walk. The Bad: Like I said before these are some super soft socks. While this is mostly positive, it will make keeping them clean a bit more of a chore. If you aren’t careful when you wash these socks, they just might come out crispy, thus making them a lot less comfortable on your baby’s feet. The Long and Short of It: These super soft socks should have no issue staying on your baby’s feet, thanks to a rolled elastic cuff that keeps them right at your kid’s ankle. 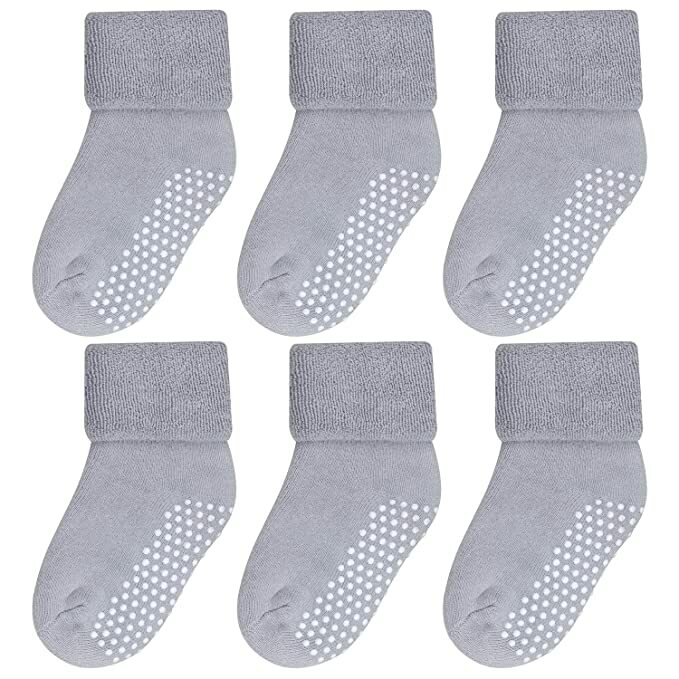 Of all the different socks that I looked at, I found that the Jefferies Socks Unisex-Baby Non-Skid Turn Cuff 6 Pair Pack are by far the best baby socks that stay on. They are not only comfortable to the touch but also feature an awesomely resilient rolled elastic cuff that will keep them on your little one no matter what! I highly recommend that you check them out! Comfy, Cozy, And Oh So Cute! Well, there you have it! Now you know everything you need to to find the best baby socks that stay on for your little one! Thank you so much for taking the time to read this article and have a wonderful day!